Since we were in the neighborhood, we figured we'd head out to Mira Loma (near San Bernardino), to get our bus serviced. We needed it lubed and oiled and just generally checkout out. Mira Loma is one of five cities in the country that has a Prevost repair shop. We visited several of them (don't ask) on our QUEEN OF THE ROAD trip. 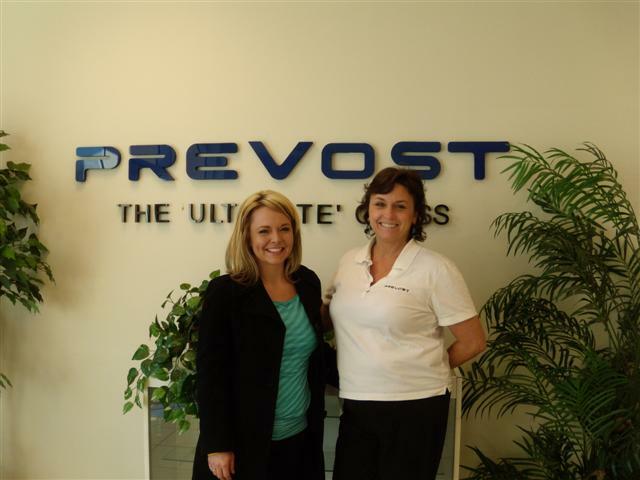 While some other repair places make you move out of your rig for days while you're being serviced, Prevost not only lets you stay in your rig, but even in their lot. It's a huge place with tons of buses, most of them belonging to touring companies (ie, "seated coaches"), but occasionally, we'll have a brush with a celebrity bus (Whoopi - call me!). In the midst of all those buses parked for various lengths of time (they also sell some on their lot), is a row of hook-ups next to a grassy patch (Prevost is not only thoughtful of their customers, but of their customers' dogs) where people like us can stay a few days. There's even an In 'n' Out nearby, and you know how I feel about my In 'n' Out. Which reminds me: Really, In 'n' Out, I have to question your customer service, since our prior experience appears to be no anomaly. Now, whenever I order my "two double-doubles, protein-style" at any location, your cashier looks at both Tim and me and asks, "Do you want fries with that?" Listen up! I'm a real woman with a real appetite and Tim hasn't ordered yet! What do you want from me? Nicole Wilson and Delene Tawater, the Service Coordinator. We had a 2 pm appointment, but that got changed a couple of days before and we were told we had to be there by 8:30 am. You know how I hate to get up early. (Imagine how much Tim hates it when I have to get up early.) But, we made it (and, believe me, I take no credit on that count). 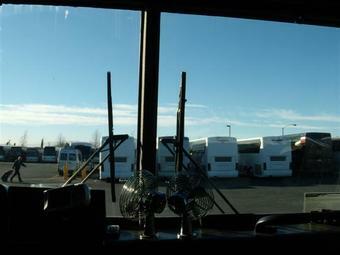 Once our bus was in the service bay, Tim asked, "They're putting the bus up on the hydraulic lift. Do you want to stay inside or come to the customer lounge?" "Are you insane? I'm going back to bed." And, I did. In the bus. (I doubted Prevost wanted me to take the word, "lounge," too literally. Besides, although they have a TV, wash-dryer and internet connection there, I didn't see a bed.) We have a white-noise machine in out bedroom, so I was able to sleep undisturbed while the bus was worked on and PN followed the mechanic around, asking questions and adding to his already impressive and excruciatingly detailed knowledge of bus guts. I'm sure you know how sorry I was to miss that. Sadly, we were told most of those buses are for sale (such a deal you could get! ), due to many of these touring companies going under. We actually found our bus this way, in 2003, on a Volvo (they own Prevost) repo lot in TN. If ya see anything ya like, I'm sure Delene will hook you up. Anyone want to caravan with us? Well, he WAS sitting down. i eat my burgers big too...and make sure i get onion rings with them. The only drawback to In 'n' Out (other than the humiliation factor) is THEY DON'T SERVE ONION RINGS!!!! As Nancy Kerrigan asked, "WHYYYYYYYYY??????" This page contains a single entry from the blog posted on January 18, 2009 3:09 PM. The previous post in this blog was A Resort Fit For A Queen. The next post in this blog is Indiana Goes Royal and Some Book Recommendations!.